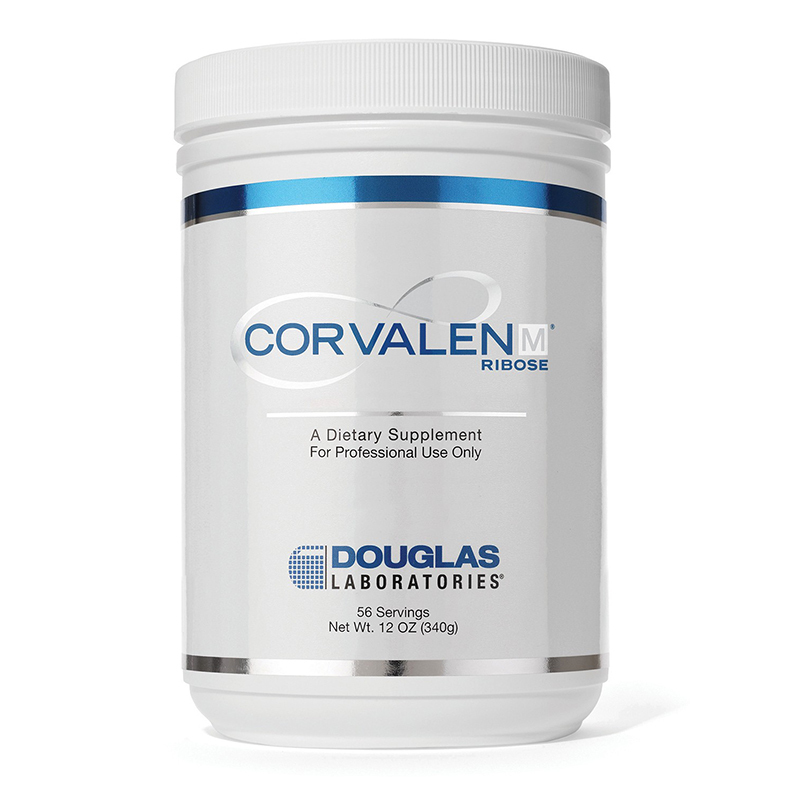 Corvalen M® D-ribose is a natural pentose sugar that is designed for the support of fatigue, cellular energy production, and mitochondrial function. 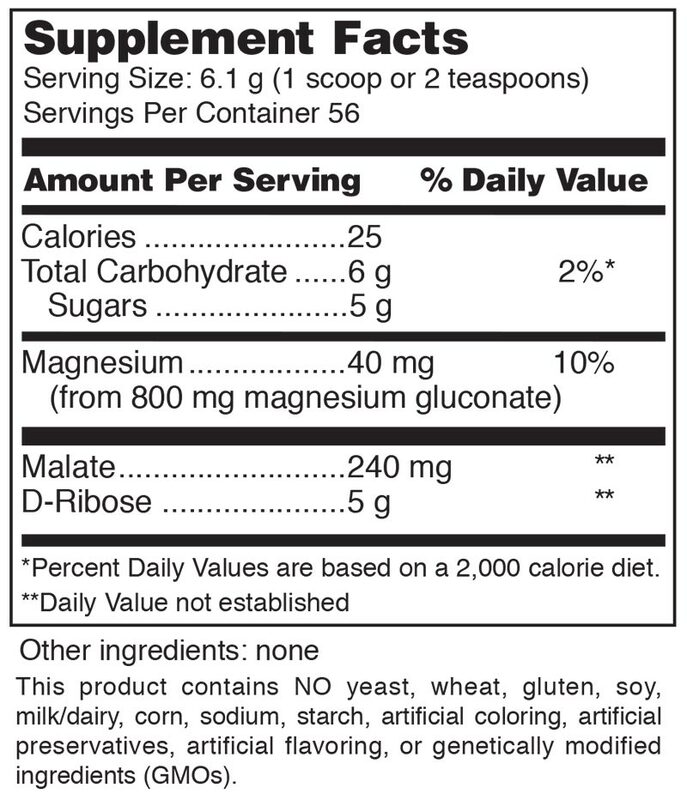 Magnesium and malate are added to this formula to help in the utilization of energy and support symptoms of fatigue. Corvalen M® contains pure D-ribose, a safe and clinically researched ingredient that supports the natural way our bodies produce adenosine triphosphate (ATP), the energy currency of the cell. Ribose is the vital structural backbone of critical cellular compounds called purines and pyrimidines. Our bodies must have an adequate supply of purines and pyrimidines to form major cellular constituents such as our genetic material (DNA and RNA), numerous cofactors, certain vitamins, and, importantly, adenosine triphosphate (ATP). Ribose is the starting point for the synthesis of these fundamental cellular compounds, and the availability of ribose determines the rate at which they can be made by our cells and tissues. D-ribose is a structural component of DNA, RNA, ATP, GTP, flavins (FAD, riboflavin) and other important nucleotides found in all living cells. Ribose is formed naturally via the pentose phosphate pathway. This pathway is slow and rate-limited in cardiac and skeletal muscle due to an inherently low concentration (lack of expression) of the enzymes, glucose-6-phosphate dehydrogenase and 6-phosphogluconate dehydrogenase. The product of this pathway is ribose-5-phosphate, which in turn is converted to 5-phosphoribosyl-1-pyrophosphate (PRPP), the primary driver in the synthesis and salvage of purine nucleotides. No other compound can be used by the body for this metabolic purpose. Purine nucleotides (ATP and its precursors) lost due to ischemia, hypoxia, or genetic predisposition are replaced via the purine nucleotide pathway. This pathway is rate limited by the availability of ribose in tissue. Administration of exogenous ribose bypasses the rate-limiting steps in the pentose phosphate pathway, resulting in a significant acceleration of PRPP.